Douglas County is home to hundreds of thousands of acres of forests that are available for public use. In fact, the Douglas County Forest along is more than 272,000 acres! We also are home to two state parks — one of which was named “State Park Treasure” by the Wisconsin Department of Natural Resources. Pattison State Park is home to Big Mantiou Falls, which at 165 feet is the highest waterfall in Wisconsin. The park encompasses more than 1,400 acres and has opportunities for hiking, camping, swimming, fishing, hunting and trapping, cross-country skiing, and snowshoeing. For more information about Pattison State Park, click here. Voted as a “State Park Treasure” in a Wisconsin Department of Natural Resources contest and as the top waterfall in Wisconsin by Lake Superior Magazine readers, Amnicon Falls State Park features a series of delightful waterfalls and rapids along the Amnicon River. You can view them from a covered footbridge or trails along the river, or if you’re sure-footed, from the rocky shore of the river. The park is a place to picnic, camp, walk in the woods, and learn about the Douglas Fault, the geological formation that created the falls. 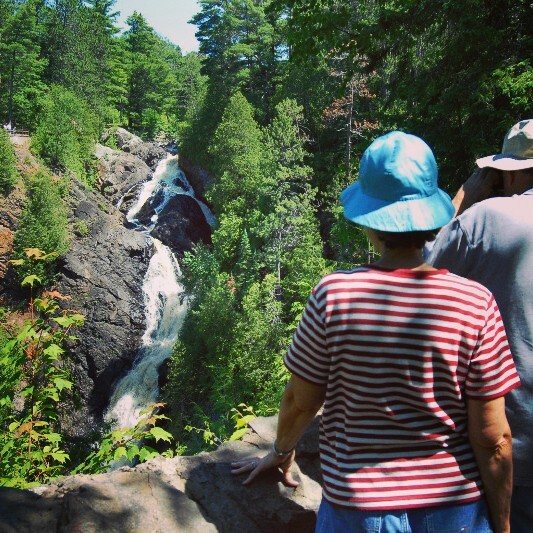 For more information about Amnicon Falls State Park, click here. The Brule River State Forest offers exceptional recreation opportunities including wildlife viewing, a 16-mile stretch of the North Country National Scenic Trail, eight miles of frontage on Lake Superior, the Bois Brule State Fish Hatchery, and much more! The forest contains all 44 miles of the Bois Brule River, one of the best-known rivers east of the Mississippi. The Brule River State Forest is also home to the Historic Bayfield Road Hiking and Snowshoe Trail. For more information, click here. The Douglas County Wildlife Area, more commonly known as the “Bird Sanctuary,” is over 4,000 acres in size and is actively managed as a brush prairie habitat encompassing both County and Department of Natural Resources-owned lands. With miles of open fields scattered with wildflowers and wildlife, this area is perfect for nature viewing. The Wildlife Area also houses stables, corrals, and a clubhouse. The log clubhouse, with its beautiful fieldstone fireplace, is available for rent and is a popular gathering place for youth groups, family parties, and educational activities. For more information, click here. The Douglas County Forest is home to five day-use parks – Anna Gene County Park, Bass Lake County Park, Long Lake County Park, Lake Minnesuing County Park, and Park Creek Pond. As these are day-use parks, no camping is allowed. For more information on these day-use parks, click here. Douglas County also has three county parks that offer camping: Mooney Dam County Park, Gordon Dam County Park, and Lucius Woods County Park. Mooney Dam County Park is located in Gordon on the Lower Eau Clair Lake and has a boat launch with excellent fishing opportunities. Gordon Dam County Park offers picnics, boating, swimming, hiking, wildlife viewing, and fishing. Lucius Woods County Park is home to the Lucius Woods Performing Arts Center and offers hiking trails, a swimming beach, and more! For more information, click here. The Superior Municipal Forest is comprised of 4,400 acres of forest and natural habitat, making it the third largest forest within a city in the nation. It is the best remaining example of a boreal forest (conifers and hardwood, including white and red pine, balsam, cedar, black spruce, white birch, and aspen) in the state of Wisconsin. Activities include hiking, mountain biking, archery, cross-country skiing, snowmobile, and winter ATV trails, canoeing, kayaking, and horseback riding. For more information, click here. ​Photo caption: Big Manitou Falls in Pattison State Park by Glenn Sanderson, courtesy of the Wisconsin Department of Tourism. Photo caption: Covered foot bridge at Amnicon Falls State Park by Anya Russom.